In the first part of our review we have already examined monuments to governors of the Russian Empire from Peter I to Pavel I. Now we will see in what monuments they perpetuated the emperors of an era from Nikolay I to Nikolay II. Alexander's brother that put the column in his honor was honored with the third in popularity capital monument. 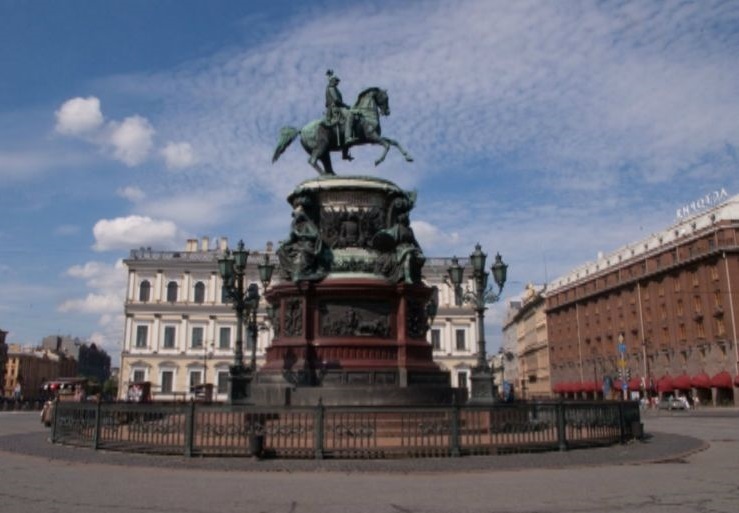 In the center of Saint Isaac's square, having turned to Mariinsky Palace (that is to the present St. Petersburg Legislative Assembly) with its back, and being in front of St. Isaac's Cathedral, shines the regal rider in a uniform of household cavalry. The statue was created by the favourite sculptor of Nikolay — the great horselover Peter Clodt, and the horse plays a major role here. They often say that an equestrian statue with two bearings on hind feet — is a unique construction; but this is an exaggeration, there are similar monuments in country and world. The uniqueness of bronze Nikolay is in another: it became both a rhyme, and the complete antithesis to the Bronze Horseman being in line with it. There is a power — and here is a parade, there is a naked rock — and here is a pedestal overloaded with symbols, there is a notable movement — and here is almost ballet ceremonial pose. Generally, Kolya will not overtake Petya not because Isaky disturbs, as the phrase goes in ancient city verset. It's just because Kolya is not eager to skip anywhere, he prances between lamps, over cars and grateful tourists. Practically all Russian emperors as it is already told, either began, or end up badly and sometimes something in between. The second Alexander on monstrosity of the end will concede only to the great-grandson and practically came up with Pavel. For the longest time the Church of the Spilled Blood was the only St. Petersburg monument in his honor. 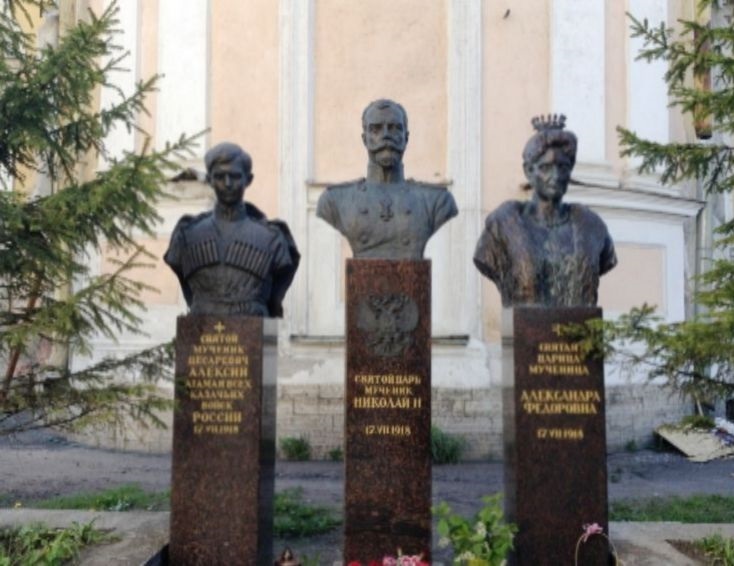 Other monuments to the Tsar Liberator located in different points of the former empire from Moscow to the deaf Bashkir village Voznesenk in the Soviet years were methodically demolished or quietly decayed. The place of heroes was taken by the representatives of popular will. 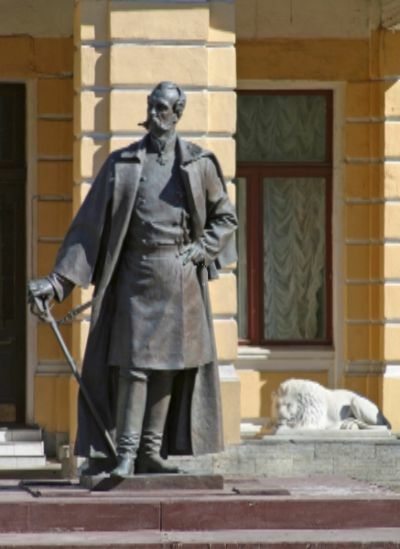 Hence the monument to worthy tsar appeared in St. Petersburg only at the beginning of the 21st century. Today there are already two monuments (or one and a half): a statue in the yard of War College on Suvorov Avenue and a small bust on Fontanka at the Central Bank building. A statue — is the copy of the Kiev monument of Antokolsky's work established in 1911 and dismantled after the revolution. In a year of St. Petersburg's tercentenary this sculpture was presented to the city by a friendly Ukraine — in 2014 it seems a twist of fate. Until quite recently the original stood at walls of the Museum of the Russian art in Kiev. If to array tsars on a degree of being crippled, Alexander III is close to the Alexander I — both had to replace brutally killed fathers on a throne. Personal characteristics of Alexander III remind Stierlitz's file: the Russophile, an awesome family man, modest in life, agnominal as Peacekeeper … However all his life he lived under the oppression of trauma, avoided the Winter Palace, was shut in Gatchina and LivadiaThe powerful physique, appearance and reputation of the regal alcoholic didn't help. The equestrian statue of Alexander III created by Paolo Troubetzkoy became the last ingenious Raman monument. He wasn't destroyed, but was banished at first to the museum and then to the yard of Marble Palace. On the one hand, it is obviously tight place for the monument, and with another — the stupid power of the fateful empire concentrated in a silhouette of the indifferent heavy rider on a heavy horse is felt even stronger. 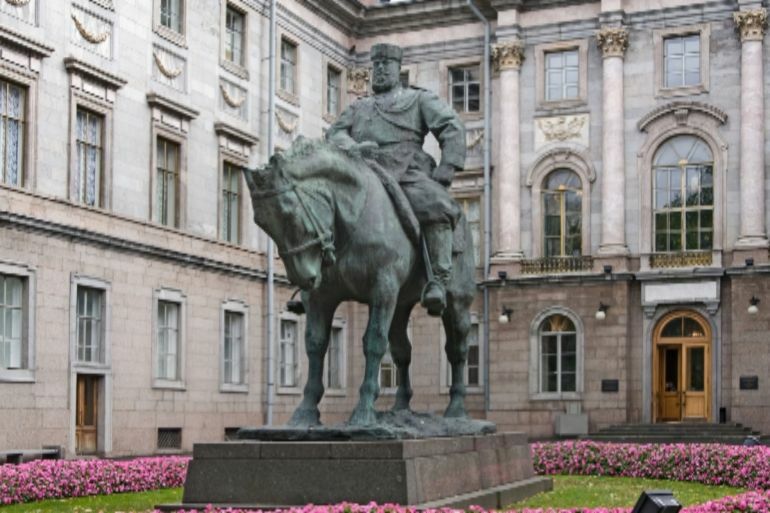 Up to nowadays only freak monarchists or fearless versatile persons like Zurab Tsereteli ventured to create monuments to the last Russian emperor — the history is too sick. Nicholas II has passed the imperial way to the end, from Khodynka to the cellar of the Ipatyevsky house. From insignificant Niki, the amateur photographer and the ideal family man, to the citizen Romanov and the tsar-martyr. "Svyatoj car' muchenik" ("The Saint tsar - martyr") — in such a manner was signed a monument that was unauthorized established by Cossacks of the Nevsky village in the yard of Holy Cross Cathedral on Ligovka. This is a historical Cossack cathedral, and the Nevsky village, or "Benefit-society of the Don Cossacks", appeared in St. Petersburg in 1899. Nikolay II was the chief of life-guard of the Cossack regiment. The monument is extremely simple — three busts on low columns. At first they fixed the tsar and then added the crown prince of Russian Empire Alexey, "the ataman of all Cossack troops of Russia" and the queen Aleksandra Fiodorovna. If to watch at pictures, there is nothing especially interesting, three bronze heads between dock-tailed fir-trees against the background of an old wall. If you'll nevertheless reach the place, it makes an unexpected impression. The corner between Ligovka and Obvodny Canal - it is difficult to find less imperial quarter. The next sight — is a gloomy known garden San Galli. The territory of the temple is surrounded by industrial zones. The main entrance with the gateway bell tower, a colonnade and statues of apostles is repaired, and behind it the space of ruins opens. The cathedral looks, as after bombing, there are wooden woods and blistering cold inside. On the walls peeled to bricks — there is a couple of big paper icons, nearby there is a cannikin with sand for candles. Not temple, but a skeleton. Imperial busts stand behind cathedral, a back to it, facing the second church of cathedral complex — Tihvinskaya. From the outside she seems to be small, and after ruin of the main temple you should wait nothing good inside. However it is snug and spacious there: the "Italian" frescos, accurately faux marble painted walls, flowers and candles, a standard of the Nevsky village, full set of Saints — here you are, you can see both the Ushakov admiral, and the queen Tamara. Facing the porch, you meet the glances of sad imperial statues and the three times repeated date of death again — 17.VII.1918. But after all life wins, and in the far corner of the church yard there is a small bloomy garden. There are apple-trees, bird cherry, lilac, huge tulips in grass. Under apple-trees there is a triangular blue lodge — probably, a beehive. The curious and well-fed striped cat is walking there. In a corner where there is an exit to the outside ligovsky world, the lazy dog lies on a chain. Romanov' family didn't even hope for such rural idyll.